(0 Customer Reviews) | Write Review 6 issues per year WellBeing is Australia’s most respected natural health and lifestyle magazine. With in-depth articles written by experts, each issue offers practical information and inspiration for mind, body and soul. WellBeing covers ways to improve the quality of your life, the lives of those around you and the health of the planet. We exist to inform, entertain and enthuse people who have chosen to take steps towards natural health and natural living. WellBeing has remained Australia’s most successful natural health magazine for over 20 years and continues to grow as topics such as sustainability, organic produce and natural therapies become more mainstream. WellBeing is an inspiring read for people passionate about natural health and therapies and for those who have just begun to take an interest in the subject. The magazine maintains its credibility by only publishing articles that are comprehensively researched and written by experts in the industry. All articles inspire, educate and enlighten. With an exciting new look and feel there’s never been a better time to subscribe! Fire is the dominant element in 2015, promising action, progress and energy. Life will change and shift and you’ll have new chances to impress your desires on the world. With this energy in mind, WellBeing Astrology focuses on authenticity and growth in both spiritual and physical realms. 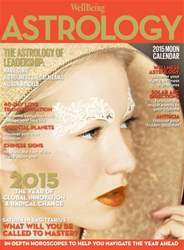 Articles include how Saturn in Sagittarius will help you commit to a meaningful path; wellness tips and lifestyle suggestions for a busier year; how a Venus retrograde in Leo can enhance your love life; and much more. Jupiter is in Leo in 2015: it’s exuberant, encourages self-confidence and is just bold enough to dare you to pursue your dreams. Leo is the sign of the Sun, and we’ve drawn on the Sun as inspiration for a collection of features designed to help you better understand yourself, including those on forecasting techniques such as antiscia and solar arc. WellBeing is Australia’s most respected natural health and lifestyle magazine. With in-depth articles written by experts, each issue offers practical information and inspiration for mind, body and soul. WellBeing covers ways to improve the quality of your life, the lives of those around you and the health of the planet. We exist to inform, entertain and enthuse people who have chosen to take steps towards natural health and natural living. You'll receive 6 issues during a 1 year WellBeing magazine subscription. You'll receive 6 issues during a 1 year WellBeing magazine print subscription.